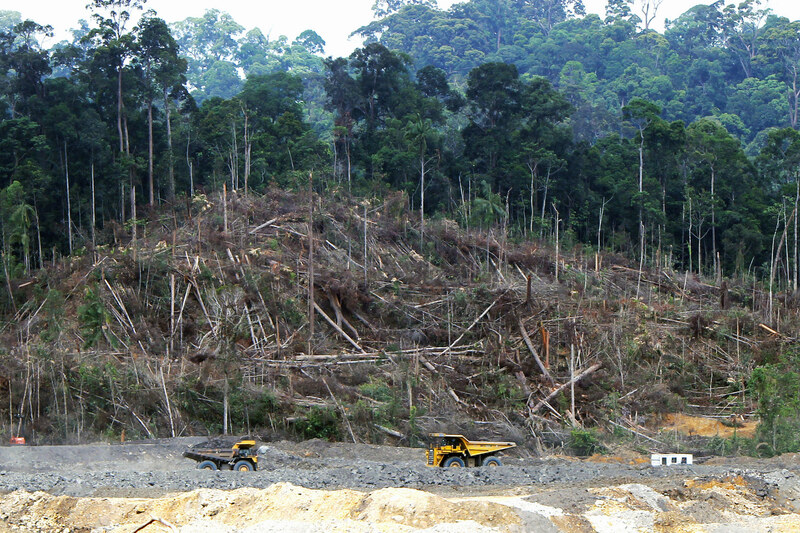 Clearing for a coal mine, central Kalimantan forest. When forests are cleared for coal mines, the threat to the planet multiplies through increased carbon emissions, and the lives of those living in the forests are often devastated. Now, for the first time, we have a global picture of where this threat lies and an estimation of its scale. By overlaying coal mining concession and forest cover data we’ve produced a global map showing that nearly 12 million hectares of forest – an area larger than Portugal – is at risk from coal mining. In Indonesia, where a coal rush in Kalimantan has led to land grabs, pollution and wholesale forest clearances with predictably dire consequences for the indigenous people, we’ve calculated that 8.6 million hectares – almost nine per cent of the nation’s total forest cover – is threatened by coal mining. In India, we found that 250,000 hectares of forest - the equivalent of 400,000 football fields - is at risk in just 13 coal fields in central India. Coal is a cornerstone of Prime Minister Narendra Modi’s government’s development strategy and one new coal mine opens in the country on average each month. Much of India’s coal lies beneath remote, dense forests, and so the fight against coal is also a fight to save forests. In Australia, the world’s fifth biggest coal producer, we found that coal mining threatens more than 1.3 million hectares of forest, equal to 2.1 million football fields. Among the most prominent examples is the ongoing development of three open-cut coal mines in the Leard State Forest in New South Wales. This will destroy some of the nation’s last unbroken remnants of critically endangered Box-Gum Woodlands and wipe out 38 sacred Aboriginal burial and heritage sites. Yet, as alarming as this is the amount of forest facing destruction for coal mining is far greater. All too frequently we found that the most recent Geographic Information System (GIS) boundary coal mining data simply wasn’t publicly available, or if so, only through commercial analysts with restrictive licensing agreements. Our calculations, for instance, don’t include China, which produces and consumes more coal than any other nation. Clearly there’s a need for much greater transparency, and governments and companies should be obliged to provide data for all current coal mining concessions. Even more critically, there’s a need to strengthen forest communities’ tenure rights. A growing body of evidence shows that the best guardians of forests are those who live in them, and that recognising customary land tenure can prevent deforestation. This is true whether forests are being destroyed for timber, agriculture or coal. India is a prime example. Arguably the greatest bulwark against clearing forests for coal there has been the Forest Rights Act (FRA), which redresses the historic injustices inflicted on the country’s forest dwellers by giving them occupation rights in forest lands. Its supporters call it ‘a weapon of democracy in forests’ – and it was deployed to great effect in the struggle between the British company Essar and the Indian government on the one hand, and local people on the other, over the former’s plans to create an open cast coal mine in the Mahan forest, in Madhya Pradesh. Mahan is a contiguous 20,000 hectare forest covering some of India’s highest quality coal and the mine block within it, said Greenpeace, would have devastated the forest and the biodiversity it supports, as well as the livelihoods of thousands of people, while having a dire impact on animals, water and air in the region. Under the FRA, mining could only proceed if a majority of villagers in the area agreed - and the Mahan villagers passed an official resolution blocking it. In March 2015, after a protracted five-year struggle, the Indian government confirmed that the Mahan forest mines would not go ahead. But while they conceded the battle, they were not ready to concede the war. The FRA’s successes reverberated through India’s corridors of power, sparking an unprecedented crackdown by the government on those seen as 'threatening India’s energy security', with activists being harassed and moves made to weaken the FRA and other major environmental laws. Nowhere more than India demonstrates how strong forest laws enshrining forest communities’ right can stop coal. And nowhere else reveals so vividly the challenges involved. Global consumption of coal may be falling, its price plummeting, and major financial institutions divesting from it - but ‘the end of coal’ is far from nigh. A January 2015 study showed that 88 per cent of the world’s known coal reserves need to stay in the ground 'to avoid dangerous climate change' and keep global warming below 2 °C, the de facto target of global climate policy.29 Stronger forest laws and giving communities greater control over the forests in which they live can help to achieve this.